Copyright: © 2017 Carlos D, et al. This is an open-access article distributed under the terms of the Creative Commons Attribution License, which permits unrestricted use, distribution, and reproduction in any medium, provided the original author and source are credited. Type 1 diabetes mellitus (T1DM) is an autoimmune disease in which the insulin-producing pancreatic β cells are damaged by the immune system. The incidence of T1DM is increasing at fast rates in many developed countries. The sharp rise can be explained by a complex interaction between genetic susceptibility and environmental factors . Therefore, several environmental factors, such as viral infections, food products and gut microbiota have been proposed as potential triggers of the disease [2,3]. There are several lines of evidence demonstrating that T1DM can be triggered by viral infection, which can cause direct β cell death and apoptosis as a result of local inflammation, molecular mimicry or cross reactivity with viral epitopes . Although several viral infections have been implicated in the progression of T1DM, particular enteroviruses have been isolated from patients newly diagnosed with the disease. In human T1DM, increased TLR3 expression occurs in mononuclear cells that infiltrate pancreatic islets . It was suggested that innate responses induced by enterovirus are sensed by TLR3, promote inflammatory pathway activation and result in β cell destruction. However, deficiency of TLR3 does not interfere in spontaneous T1DM development in the non-obese diabetic (NOD) mouse . Conversely, TLR3 plays a fundamental role in virus-induced T1DM in NOD and C57BL/6 mice [7,8]. Additionally, TLR7 signaling induced by viral RNA or synthetic ligand can initiate pathogenic lymphocyte activation and precipitate diabetes in NOD mice [9,10]. In addition to viral products, endogenous ligands, released after the process of death or cellular damage, may also activate the innate immune system and drive the adaptive immune response in T1DM. This hypothesis is reinforced by the occurrence of marked β cell apoptosis prior to the onset of the insulitis process in NOD mice, with subsequent conversion into cells exhibiting necrotic signals . Thus, delayed clearance and subsequent accumulation of apoptotic cells appears to be one of the inducing mechanisms of T1DM. In fact, apoptotic cells undergoing secondary necrosis are able to activate antigen presenting cells (APCs), which in turn stimulate pathogenic T lymphocytes through a TLR2-dependent mechanism in T1DM . Accordingly, higher expression of high mobility group box 1 (HMGB1), an inflammatory endogenous trigger, was found in the cytoplasm of islet cells in diabetic NOD mice compared with non-diabetic mice . HMGB1 may act through TLR4 and directly damage β cells during T1DM progression. In addition, the use of monoclonal antibody to TLR4/MD-2 (TLR4-Ab) reversed genetically-induced T1DM in NOD mice, by a mechanism dependent on induction of tolerogenic APCs and expansion of regulatory T cells (Tregs) in both the periphery and the pancreatic islets . In contrast, TLR4-deficient mice crossed with NOD mice (TLR4/NOD) develop accelerated T1DM compared to wild-type NOD mice [15,16]. TLR9 recognizes unmethylated CpG DNA present in bacteria, viruses and in mammalian cells. TLR9 is mainly located in the endoplasmic reticulum membrane, endosomes and lysosomes of several immune cells [17,18]. In the T1DM model induced by streptozotocin (STZ), administration of a CpG-containing oligodeoxynucleotide (TLR9 agonist) marked ameliorates the disease. In accordance, mice lacking TLR9 develop a more profound disease associated with lower indoleamine 2,3-dioxygenase (IDO) expression in pancreatic lymph nodes (PLNs) . In contrast, TLR9-deficient mice crossed with NOD mice (TLR9/NOD) are protected from T1DM development . In addition, the resistance observed in TLR9/NOD mice is mediated by lower IFN-∝ expression and decreased number of diabetogenic CD8 T cells in PLNs . Overall, TLR9 may either function as a protective or a pathogenic signal in T1DM development (Figure 1). Figure 1: Innate immunity activation during type 1 diabetes (T1DM) pathogenesis. Several environmental factors have been proposed as potential triggers of T1DM, like viral infections, food components and gut microbiota. Virus and gut microbiota contains products named pathogen-associated molecular patterns (PAMPs), which are able to activate innate immune receptors such as Toll-Like receptors (TLRs). The activation of these receptors in macrophages or dendritic cells (DCs) activates the downstream TRIF and MyD88 signaling pathways, induces the translocation of transcription factors NF-κB or IRFs and production of inflammatory cytokines and type 1 interferons (type 1 IFNs). 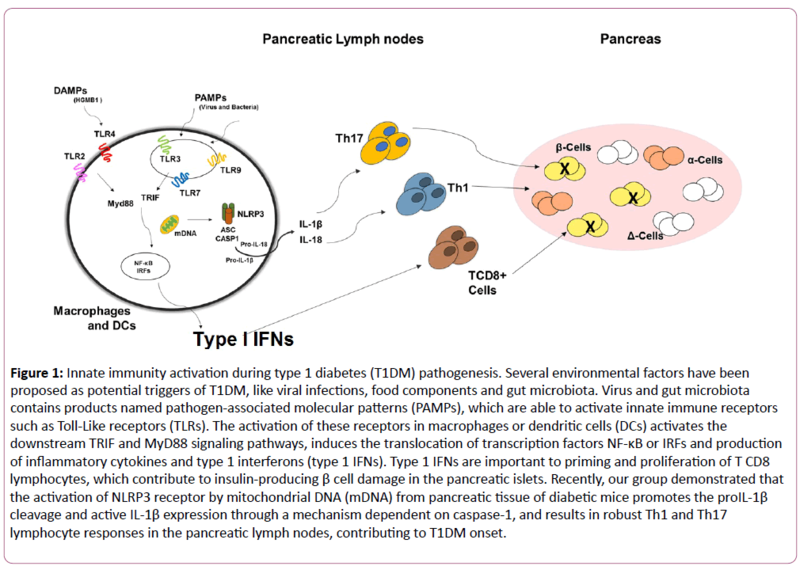 Type 1 IFNs are important to priming and proliferation of T CD8 lymphocytes, which contribute to insulin-producing β cell damage in the pancreatic islets. Recently, our group demonstrated that the activation of NLRP3 receptor by mitochondrial DNA (mDNA) from pancreatic tissue of diabetic mice promotes the proIL-1β cleavage and active IL-1β expression through a mechanism dependent on caspase-1, and results in robust Th1 and Th17 lymphocyte responses in the pancreatic lymph nodes, contributing to T1DM onset. NLRP3 is an important component of the inflammasome, a protein complex that contains NLRP3, apoptosis-associated speck-like protein (ASC) and caspase-1 [22,23]. NLRP3 activation leads to oligomerization and recruitment of ASC and procaspase-1, which mediates autocleavage and activation of caspase-1. These protein complexes are responsible for the innate immune response activated by pathogen-associated molecular patterns (PAMPs) or damage associated molecular patterns (DAMPs) . Although caspase-1 or IL-1β deficiency does not protect NOD mice from T1DM [25,26], a recent study showed the importance of NLRP3 inflammasome in the pathogenesis of T1DM in NOD mice . The protection observed in NLRP3-deficient mice is attributed to reduced T cell activation, Th1 differentiation and migration of pathogenic T cells to pancreatic islets through chemokine receptors CCR5 and CXCR3 expression . Our group demonstrated that mitochondrial DNA (mDNA) isolated from diabetic mice displays an intrinsic capacity to activate NLRP3 inflammasome in macrophages. Furthermore, increased expression of mDNA-related genes is detected in serum of diabetic mice. Also, mDNA administration induces IL-1β production associated with the induction of pathogenic lymphocytes in the PLNs, which facilitates the effect of STZ to induce T1DM onset . Interestingly, recent genetic studies indicate that polymorphisms in inflammasome genes contribute to T1DM predisposition and that a coding polymorphism in NLRP1 confers susceptibility to T1DM . Furthermore, two single-nucleotide polymorphisms in NLRP3 were identified as a risk factor for T1DM . Thus, our data suggest that the NLRP3- mDNA axis may represent a valuable target in the prevention/ therapy of T1DM. T1DM is a highly prevalent autoimmune disease that is triggered by both genetic and environmental factors. Although pancreatic β cells apoptosis appears to be the last event in the development of T1DM, the initial triggers are still unknown. However, strong evidence suggests that the release of PAMPs or DAMPs from β cells may be sensed by innate receptors on myeloid cells like macrophages and dendritic cells, and shape the pathogenic adaptive immunity, which in turn contributes to T1DM onset. These findings regard them as putative targets in the prevention or treatment of T1DM pathogenesis. Redondo MJ, Yu L, Hawa M, Mackenzie T, Pyke DA, et al. (2001) Heterogeneity of type I diabetes: analysis of monozygotic twins in Great Britain and the United States. Diabetologia 44: 354-362. Knip M, Veijola R, Virtanen SM, Hyöty H, Vaarala O, et al. (2005) Environmental triggers and determinants of type 1 diabetes. Diabetes 54 Suppl 2: S125-136. Hu Y, Wong FS, Wen L (2017) Antibiotics, gut microbiota, environment in early life and type 1 diabetes. Pharmacol Res 119: 219-226. Filippi CM, von Herrath MG (2008) Viral trigger for type 1 diabetes: pros and cons. Diabetes 57: 2863-2871. Kaoru Aida, Yoriko Nishida, Shoichiro Tanaka, Taro Maruyama, Akira Shimada, et al. (2011) RIG-I- and MDA5-initiated innate immunity linked with adaptive immunity accelerates beta-cell death in fulminant type 1 diabetes. Diabetes 60: 884-889. Wong FS, Hu C, Zhang L, Du W, Alexopoulou L, et al. (2008) The role of Toll-like receptors 3 and 9 in the development of autoimmune diabetes in NOD mice. Ann N Y Acad Sci 1150: 146-148. Lang KS, Recher M, Junt T, Navarini AA, Harris NL, et al. (2005) Toll-like receptor engagement converts T-cell autoreactivity into overt autoimmune disease. Nat Med 11: 138-145. McCall KD, Thuma JR, Courreges MC, Benencia F, James CB, et al. (2015) Toll-like receptor 3 is critical for coxsackievirus B4-induced type 1 diabetes in female NOD mice. Endocrinology 156: 453-461. Lee AS, Ghoreishi M, Cheng WK, Chang TY, Zhang YQ, et al. (2011) Toll-like receptor 7 stimulation promotes autoimmune diabetes in the NOD mouse. Diabetologia 54: 1407-1416. Pane JA, Webster NL, Coulson BS (2014) Rotavirus activates lymphocytes from non-obese diabetic mice by triggering toll-like receptor 7 signaling and interferon production in plasmacytoid dendritic cells. PLoS Pathog 10: e1003998. Zhang S, Zhong J, Yang P, Gong F, Wang CY (2009) HMGB1, an innate alarmin, in the pathogenesis of type 1 diabetes. Int J Clin Exp Pathol 3: 24-38. Kim HS, Han MS, Chung KW, Kim S, Kim E, et al. (2007) Toll-like receptor 2 senses beta-cell death and contributes to the initiation of autoimmune diabetes. Immunity 27: 321-333. Li M, Song L, Gao X, Chang W, Qin X (2012) Toll-like receptor 4 on islet Î² cells senses expression changes in high-mobility group box 1 and contributes to the initiation of type 1 diabetes. Exp Mol Med 44: 260-267. Bednar KJ, Tsukamoto H, Kachapati K, Ohta S, Wu Y, et al. (2015) Reversal of New-Onset Type 1 Diabetes With an Agonistic TLR4/MD-2 Monoclonal Antibody. Diabetes 64: 614-3626. Burrows MP, Volchkov P, Kobayashi KS, Chervonsky AV (2015) Microbiota regulates type 1 diabetes through Toll-like receptors. Proc Natl Acad Sci USA 112: 9973-9977. Gülden E, Ihira M, Ohashi A, Reinbeck AL, Freudenberg MA, et al. (2013) Toll-like receptor 4 deficiency accelerates the development of insulin-deficient diabetes in non-obese diabetic mice. PLoS One 8: e75385. Applequist SE, Wallin RP, Ljunggren HG (2002) Variable expression of Toll-like receptor in murine innate and adaptive immune cell lines. Int Immunol 14: 1065-74. Blasius AL, Beutler B (2010) Intracellular toll-like receptors. Immunity 32: 305-315. Fallarino F, Volpi C, Zelante T, Vacca C, Calvitti M, et al. (2009) IDO mediates TLR9-driven protection from experimental autoimmune diabetes. J Immunol 183: 6303-6312. Tai N, Wong FS, Wen L (2013) TLR9 deficiency promotes CD73 expression in T cells and diabetes protection in nonobese diabetic mice. J Immunol 191: 2926-2937. Zhang Y, Lee AS, Shameli A, Geng X, Finegood D, et al. (2010) TLR9 blockade inhibits activation of diabetogenic CD8+ T cells and delays autoimmune diabetes. J Immunol 184: 5645-5653. Latz E, Xiao TS, Stutz A (2013) Activation and regulation of the inflammasomes. Nat Rev Immunol 13: 397-411. McCoy AJ, Koizumi Y, Higa N, Suzuki T (2010) Differential regulation of caspase-1 activation via NLRP3/NLRC4 inflammasomes mediated by aerolysin and type III secretion system during Aeromonas veronii infection. J Immunol 185: 7077-7084. Schroder K, Zhou R, Tschopp J (2010) The NLRP3 inflammasome: a sensor for metabolic danger? Science 327: 296-300. Schott WH, Haskell BD, Tse HM, Milton MJ, Piganelli JD, et al. (2004) Caspase-1 is not required for type 1 diabetes in the NOD mouse. Diabetes 53: 99-104. Wen L, Green EA, Stratmann T, Panosa A, Gomis R, et al. (2011) In vivo diabetogenic action of CD4+ T lymphocytes requires Fas expression and is independent of IL-1 and IL-18. Eur J Immunol 41: 1344-1351. Hu C, Ding H, Li Y, Pearson JA, Zhang X, et al. (2015) NLRP3 deficiency protects from type 1 diabetes through the regulation of chemotaxis into the pancreatic islets. Proc Natl Acad Sci USA 112: 11318-11323. Carlos D, Costa FR, Pereira CA, Rocha FA, Yaochite JN, et al. (2017) Mitochondrial DNA Activates the NLRP3 Inflammasome and Predisposes to Type 1 Diabetes in Murine Model. Front Immunol 8: 164. Magitta NF, Bøe Wolff AS, Johansson S, Skinningsrud B, Lie BA, et al. (2009) A coding polymorphism in NALP1 confers risk for autoimmune Addison's disease and type 1 diabetes. Genes Immun 10: 120-124. Pontillo A, Brandao L, Guimaraes R, Segat L, Araujo J, et al. (2010) Two SNPs in NLRP3 gene are involved in the predisposition to type-1 diabetes and celiac disease in a pediatric population from northeast Brazil. Autoimmunity 43: 583-589.